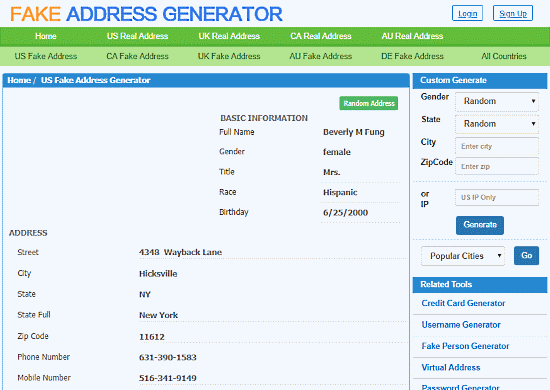 This article covers 5 free online random address generator websites. With these websites, you can instantly generate random US street addresses in seconds. You can generate one or multiple addresses. The generated addresses are completely random with street info and zip code. Some of these websites let you generate custom location-based addresses. Whereas some generate a whole new random identity. They generate random biodata, address, internet profiles, educational and financial information. So, Let’s start our list and see what these websites offer. Random Lists is a free website to generate different types of random stuff. It is a quick solution to generate random address(es). To generate random addresses here, you just have to visit its “Random Addresses” tool and click the “Return” button. This tool will generate a random address for you. You can also generate multiple random addresses with this tool. Simply go to “Options” and type the number of random addresses you want to generate and it will generate that many random addresses for you. Try this online random address generator here. Fakena is a fake name generator website that generates a random address, along with a name, username, password and a usable (temporary) email address. This website generates a completely random identity that you can use for online games, social media or whatever. As all these information is random and replaced with new info on your next visit. This website gives you two options to save the information. One solution is to print the info to PDF and another one is to generate a permalink for the info. You can try this online random address generator here. The next random address generator website on this list is BestRandoms. This is another free website to generate various types of random information. It has a random address generator tool that generates 6 random addresses at once. 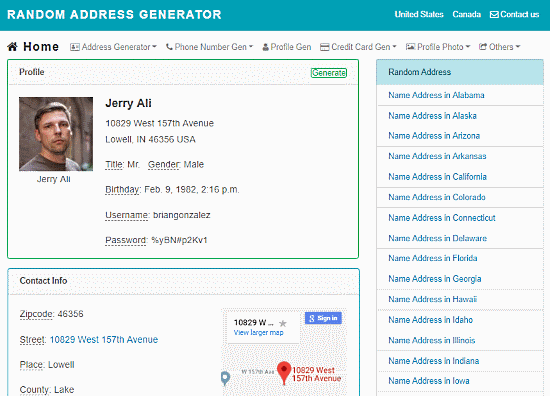 The main feature of this random address generator is that you can customize it to generate addresses for a specific city or state. You can select a state, city and enter a zip code to generate location-specific random addresses. Give this online random address generator a try here. Random Address Generator website generates a complete random address for you. This complete address here includes a random fake identity with a photo, random financial information (like credit card details, job, salary, etc. ), and internet information (like username, password, email, IP address, etc.). Apart from all this information, it also generates random personality traits like favorite color, movie, song, etc. along with a section that describes random physical appearance. If you are not satisfied with any information, just click the “Generate” button again and all that information will get replaced with new random info. Here is the link to this online random address generator. 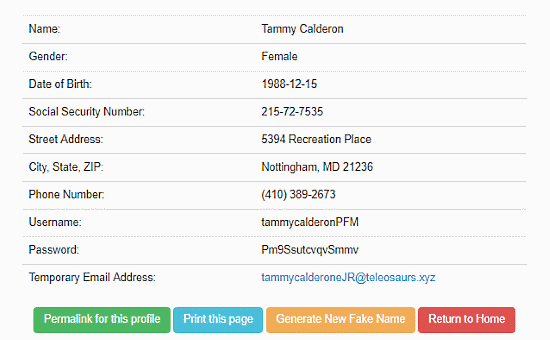 FakeAddressGenerator is very similar to previous Random Address Generator website. It also generates all that extra information along with a random address. But the different thing here is location filters. 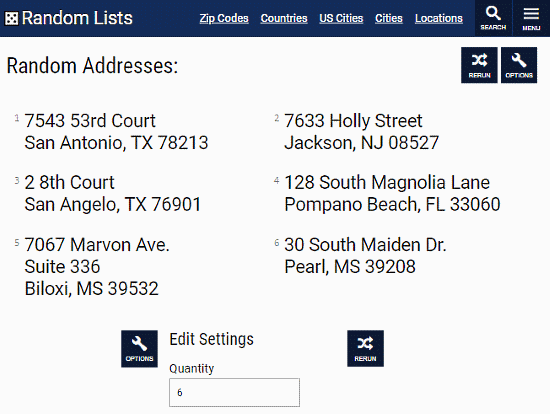 You can customize this random address generator to generate an address for a specific state, city or zip code. Simply type any state, city or zip to generate location specific address. You can also browse random addresses sorted by popular cities here. These random address generator websites are quick and easy to use. 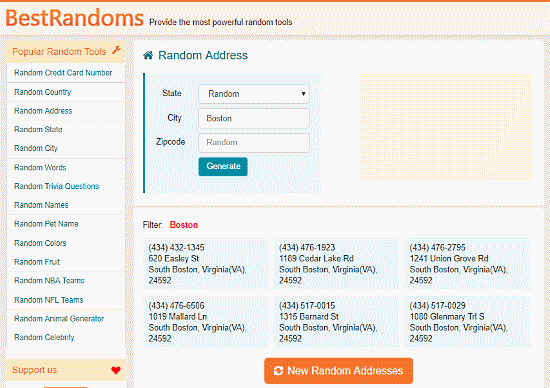 You can easily generate multiple random addresses instantly. So, whenever you need a quick random address, these are the websites for you.